Imaging: The VERION Reference Unit performs almost all critical measurements in a single step, creating a high-resolution, digital reference image of the eye. Planning:The VERION Reference Unit combines multiple, proven algorithms to help surgeons determine the optimal intraocular lens (IOL) and lens power for patients with and without astigmatism. Guidance:The VERION Digital Marker provides automated centration and incision positioning. 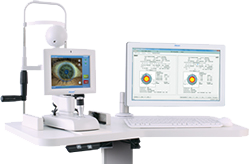 The system eliminates the need to manually mark the eye for alignment of toric IOLs. Once the VERION Image Guided System has captured the reference image of the eye and helped generate a surgical plan, it seamlessly integrates the surgical plan in the operating room via a tracking overlay, allowing the surgeon to see all incisions and alignment in real time.